104.99 GBP Only 1 left In stock, ready to dispatch. 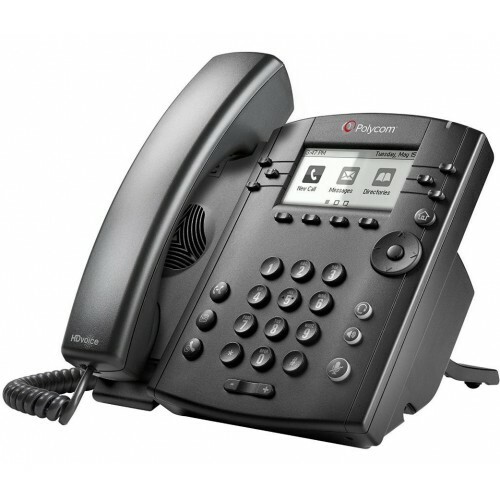 The Polycom VVX 300 is an entry-­level business VoIP phone featuring a backlit monochrome LCD display, high-­definition audio and all of the other features that you would expect from a standard corded phone. Designed to reduce the costs and complications associated with deployment and maintenance, the Polycom VVX 300 uses a simple, Web­based configuration tool to make it quicker and easier than ever to connect the phone to the VoIP services that your company uses. With the clear audio afforded by VoIP telephony, the Polycom VVX 300 provides quality high- definition audio with voice reproduction of up to 7 KHz through the speaker, handset and optional connected headset. Offering easy deployment and up to six speed­dial keys, the Polycom VVX 300 is an affordable corded VoIP phone designed for business use, and it is compatible with hand-s­free solutions.